Mount Foraker is a 17,400-foot (5,304 m) mountain in the central Alaska Range, in Denali National Park, 14 mi (23 km) southwest of Denali. It is the second highest peak in the Alaska Range, and the third highest peak in the United States. It rises almost directly above the standard base camp for Denali, on a fork of the Kahiltna Glacier also near Mount Hunter in the Alaska Range. Its north peak was first climbed on August 6, 1934, and its higher south peak was climbed four days later on August 10, by Charles Houston, T. Graham Brown, and Chychele Waterston, via the west ridge. Mount Foraker was named in 1899 by Lt. J. S. Herron after Joseph B. Foraker, then a sitting U.S. Senator from Ohio. The mountain, along with Denali, was called Bolshaya Gora ("big mountain") in Russian. 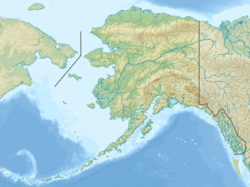 The Tanaina Indians of the Susitna River valley and Tanana Indians to the north are reported to have had the same name (Denali) for Mt. Foraker as they had for Denali (previously Mount McKinley), and it appears that the names were not applied to individual peaks but instead to the Denali massif. The Tanana Indians in the Lake Minchumina area, however, had a broadside view of the mountains and thus gave distinctive names to each. According to Hudson Stuck, these Indians had two names for Mount Foraker: Sultana meaning "the woman" and Menlale meaning "Denali's wife". 1934 West Ridge FA of Mount Foraker by Charles Houston, T. Graham Brown and Chychele Waterston. 1963 Southeast Ridge. 2nd ascent. July 7th. By Jim Richardson and Jeff Duenwald. Expedition led by Adams Carter. 1968 Talkeetna Ridge, South Ridge FA by Alex Bertulis, Warren Bleser, Hans Baer and Peter Williamson (US). The summit was reached on July 26, 1968. 4th ascent of peak. 1974 Southwest Toe of Southeast Ridge, variation to the South Ridge, ascent by Peter Reagan, Joe Davidson, Bob Fries, Jim Given, Mark Greenfield, Pippo Lionni, Eric Morgan and Frank Uher. 1975 Archangel Ridge, the north ridge, FA by Gerard and Barbara Roach (first ascent by a woman), Brad Johnson, David Wright, Stewart Krebs and Charles Campbell. Summit reached on July 14, 1975. Subsequently skied. 1976 French Ridge, the South/Southeast Ridge, FA by Henri Agresti, Jean-Marie Galmiche, Gerard Creton, Herve Thivierge, Isabelle Agresti (all France) and Werner Landry (US). Summit reached on June 3 and 4, 1976. 1977 Infinite Spur, on the south face by Michael Kennedy and George Lowe. Ascent time 6 days. 1977 Southwest Ridge, Nancey Goforth, Erik LeRoy, Chris Liddle, and Murray Marvin. The summit was reached on June 25, 1977, after 47 days spent on Mount Foraker. 1989 Infinite Spur, second ascent or route by Mark Bebie and Jim Nelson (US). Summit reached on June 24, 1989 after 13 days on the mountain. 1990 False Dawn, on the southeast face, first ascent by John Phelan (US) and David Sharman (UK). Summit reached on May 27, 1990 after 5 days on the mountain. 2016 Infinite Spur, first solo ascent and fastest ascent to date, by Colin Haley. Ascent time was 12:29 from the bergschrund to summit. The descent was completed in a whiteout via the Sultana Ridge over the ensuing 48 hours. Mt Foraker, on the left, is shown near Denali, on the right, taken from Kashwitna Lake roughly 100 miles (160 km) south of the mountains. Mt Hunter is just to the left of Denali. ^ a b c d "Mount Foraker". Peakbagger.com. Retrieved 2010-03-20. ^ "Elevations and Distances in the United States". United States Geological Survey. Retrieved 1 November 2015. ^ a b c "Mount Foraker". Geographic Names Information System. United States Geological Survey. Retrieved 2004-10-07. ^ "Mount Foraker". Bivouac.com. Retrieved 2008-07-10. ^ Geological Survey Professional Paper, Volume 567. U.S. Government Printing Office. 1967. p. 345. ^ Roach, Gerard (1976). "The Archangel - Foraker's North Ridge". American Alpine Journal. New York, NY, USA: American Alpine Club. 20 (50): 277. ISBN 978-0-930410-73-5. ^ Carter. "American Alpine Club Journal". ^ Bleser, Warren; Bertulis, Alex (1969). "Mount Foraker's South Ridge". American Alpine Journal. Philadelphia, PA, USA: American Alpine Club. 16 (43): 289–294. ^ Reagan, Peter (1975). "Mount Foraker, Southeast Ridge". American Alpine Journal. New York, NY, USA: American Alpine Club. 20 (49): 116. ^ Roach, Gerard (1976). "The Archangel - Foraker's North Ridge". American Alpine Journal. New York, NY, USA: American Alpine Club. 20 (50): 277–284. ISBN 978-0-930410-73-5. ^ Agresti, Henri (1977). "Mount Foraker, South-Southeast Ridge". American Alpine Journal. New York, NY, USA: American Alpine Club. 21 (51): 149–152. ^ Selters, Andy (2004). Ways to the Sky. Golden, CO, USA: American Alpine Club Press. p. 263. ISBN 0-930410-83-1. ^ LeRoy, Erik (1978). "Foraker's Southwest Ridge". American Alpine Journal. New York, NY, USA: American Alpine Club. 21 (52): 359–365. ^ Bebie, Mark (1990). "Foraker's Infinite Spur". American Alpine Journal. New York, NY, USA: American Alpine Club. 32 (64): 28–35. ISBN 0-930410-43-2. ^ "False Dawn—Foraker". American Alpine Club. Retrieved 2015-03-14. ^ Haley, Colin. "Infinite Spur Laps". Retrieved 8 May 2017. ^ This ranking includes Denali North Peak as number 2. This page was last edited on 14 February 2019, at 20:48 (UTC).